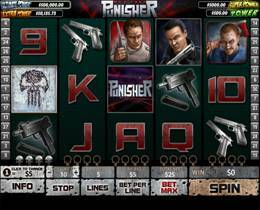 Playtech and Marvel comics have co-operated to release The Punisher : War Zone Slot and the result will certainly impress addicts of the Punisher. 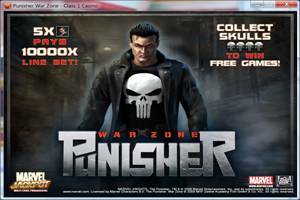 Frank Castle, the hero from the Marvel Comic version, is again after the bad guys and the theme is enhanced with icons depicting pistols, Uzis, skulls and other great graphics complete with realistic sounds. 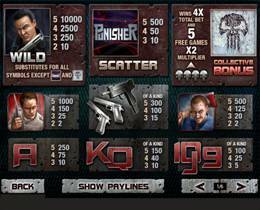 The Wild is Frank Castle and spin 5 of Frank on an active pay line and you are awarded a great prize of 10,000 coins. Wilds are stacked making it possible to fill the whole reel with Frank Castle Wilds. There is a huge betting range from $0.01 to$100.00 And coins between $0,01 and $0.50 are accepted, so all tastes are catered for. The Skulls are the Scatter prize and spin between 2 and 5 anywhere and you win multipliers and free spins.